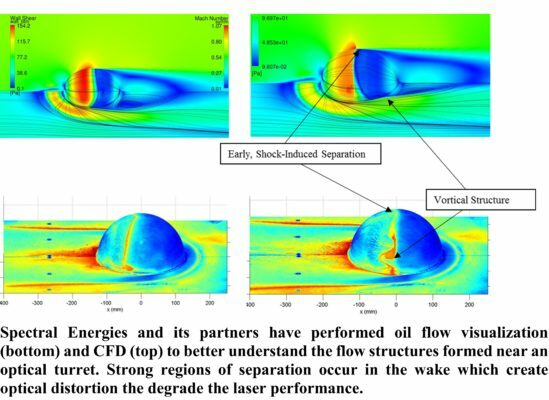 Spectral Energies and its partners at the University of Notre Dame, Georgia Tech, and Florida State University have been working on innovative and practical methods to implement airborne High-Energy Laser (HEL) systems for both subsonic and supersonic flight regimes for the past 5 years. One of the challenges associated with airborne HEL systems is optical distortions caused by turbulence in the wake of the optical housing. This can cause among other things a reduction in the power that arrives at the target and degradation in accuracy. 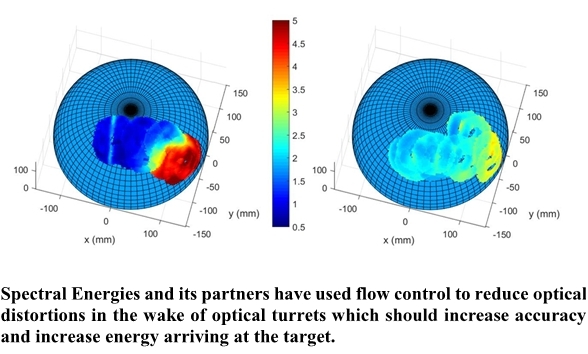 The team has developed and is still developing passive and active flow control methodologies for reducing the turbulence in the wake of the turret which will help mitigate optical distortions. These methods have been applied in wind tunnel testing, computational validations, and on an actual aircraft.